These new cleanses are “religion without theology,” my friend Ruby quipped. But now that I’ve read [Alejandro] Junger’s Clean, the best-selling text of the cleansing movement, I’ve decided I don’t agree. Clean is theology all the way down. As in many a devotional text, fasting is presented as a way to embody a purer social order. Food is the focus of an enormous amount of modern moralism, and there’s nothing that speaks more to our binge-and-purge commercial culture, with our stuffed storage units and speedily evolving fashion trends. The backbone it takes to drink juice and only juice is perfect for New Yorkers, where a big part of life is discipline: getting up every day in a challenging place, grocery shopping without a car, dragging the kids on the sidewalk, forking over a hundred bucks for supper with a smile. One communicates one’s self-worth to others through one’s commitment to the ideals of the city, with success and skinniness at the top of that list. With juice, you can wash everything away, all the things that make you feel helpless. You can’t control the trajectory of your career in an unstable new economy, or where your kid gets into school, or if the city will flood again—that’s happening way over your head. You are above it all. You spent the money on the juice (and the exercise, and whatever else), and you will be a success. There’s no reason to be anxious, because you have everything under control. Can I get an amen? 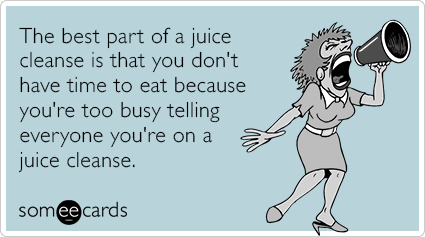 Nothing about this is limited to juicers of course (or Paleo diehards or Pure Barre advocates, etc). As we never tire of saying, everyone is religious, regardless of whether or not they go to church or believe in God. If our body isn’t serving as our, er, temple, some other venue invariably is. The spread on our table or the harmony in our family room this Thursday for instance (or the number of attendees at our next conference!). There seems to be something in our DNA that craves a sense of righteousness, that won’t allow juice just to be juice, that’s instead hellbent on subordinating anything and everything to our self-justification, even ostensibly good things like nutrition and fitness. 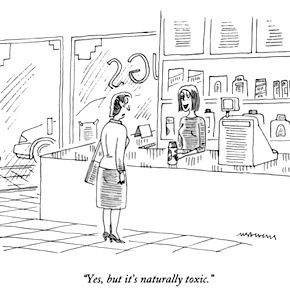 The cleanse mentality is more than just judgmental and irritating: It’s dangerous. Making each meal a drama of discipline, deprivation, and control? Floating along on a superior high that isn’t really about how much weight you’re losing (but actually kind of is about how much weight you’re losing)? Seeking to express your achievements, be they moral, social, or financial, in the most visible terms you can manage? If this were a sermon, the text would come from Matthew 6, and I’d take this as my cue to talk about imputed righteousness. I’d talk about the one who came not for the healthy but the sick (and went out of his way to feed the hungry/thirsty), and God-willing we might all walk away feeling a bit of comfort, maybe even some seasonally appropriate gratitude. Who knows, I might’ve even closed with a prayer for the next time we reach for that sleek, sustainable bottle, that we might find ourselves thinking not of juice but of… blood. Thankfully, this isn’t a sermon–I sure wouldn’t want to spoil anyone’s appetite. At least not this week. I cannot even tell you how much I love this. As someone who has become his own medical practitioner via the www. this bit is a home run, over the fence! Delightful. Love it. I hope you’re not talking about your steak . . . Such an insightful post … Thank you.